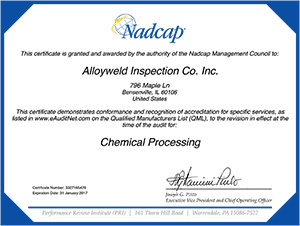 Services - Alloyweld Inspection Co. Preserving and preparing a variety of metals for any number of specific industry demands is a specialty of Alloyweld. Our accredited technicians’ knowledge of metallurgy is rare among today’s ranks of metal finishing houses. If you need metal finishing, you need Alloyweld.